I just double checked mine, because I remember 23andme telling me I'm pretty high on the list of Neanderthal compared to my family and friends. ;-) As of today I rank 7th, coming in at 326 variants. 23andme reports the top profile has 397 variants. I have no Y chromosome, and my father's Y DNA is the Jewish Q variety. 103 variants which is pretty high for Somalis.The average Somali seems to be around 80-90s while Ethiopians/Eritreans get between 100-150 with the ones similar to mine usually being of Oromo origin. You have 7 Neanderthal variants. 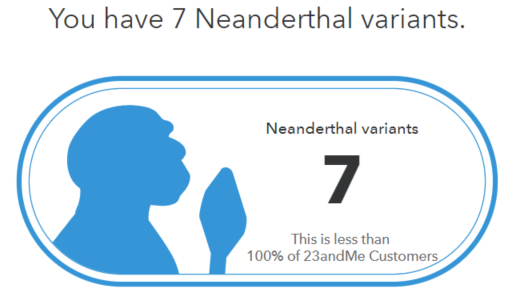 You have fewer Neanderthal variants than 100% of 23andMe customers. ... fewer than 100% of the database -- beat that! Wow, you have an exceptionally high amount. I've only seen like 2-3 people in my DNA relatives list from the Balkans with a higher amount than myself. I know this is not related to the topic, but on average how much Neanderthal variants do Middle Easterners have? My fellow grandfather, who is 87.2% African in ancestry, carries 47 Neanderthal variants, which is less than 100% of 23andMe customers! Found it interesting that two of my family connections, who are 85% and 86.6% Native American in ancestry carry 270 and 274 Neanderthal variants which is quite close to my own 275 variants. I have 324 variants and my brother has 277. Amongst our DNA matches, the highest is 353. Wow! -- in that case I wonder what's the cutoff for "100%" of customers.